Offering clothing optional accommodation for gay and bisexual men, Hideaway Noosa Men Only Beach Resort is less than 1 minutes’ walk from the beautiful sands of Peregian Beach. 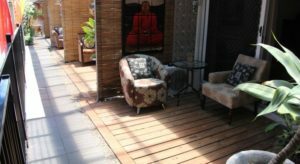 Guests enjoy free WiFi, an outdoor saltwater swimming pool, an outdoor hot tub and a men’s theatre room. 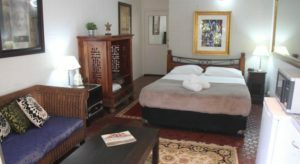 Each of the air-conditioned rooms has a flat-screen TV and a private or shared bathroom. Some rooms offer a kitchenette with a refrigerator, microwave and tea/coffee making facilities. There is also a communal kitchenette. After a relaxing day at the beach, guests can laze on a sun lounger by the pool. 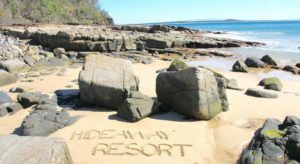 Hideaway Noosa Men Only Resort is within 8 minutes’ drive of Noosa National Park and Noosa’s vibrant restaurants, cafes and boutique shops. Mount Coolum Golf Club is a 15-minute drive away. Sunshine Coast Airport is a 20-minute drive. You can check prices and availability for booking this resort here by clicking here.